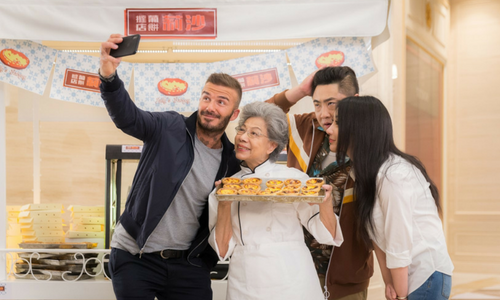 Sands Resorts Macao’s new online micro-movie featuring its brand ambassador David Beckham has been criticised for the star speaking Mandarin, the official language of China, instead of Cantonese. In the micro-movie, joining the international sports star and The Venetian Macao brand ambassador Beckham are leading Chinese celebrities and actors – including Qiao Shan (taxi driver), Yang Di (waiter), Liu Yan (taxi driver’s sister), Lam Suet (chef), Cao Tu Jun (restaurant staff) and Helena Law Lan (bakery owner/grandmother) – who take him on a quest to find the perfect Portuguese egg tart in Macau. The movie aims to showcase The Venetian Macao, The Parisian Macao and Macau as destinations renowned for Macau’s legendary egg tarts and a must-see on every visitor’s agenda when they visit. However, internet users were not impressed with the language choice of the ambassador, the reason being the mother language of Macau and Hong Kong people is Cantonese. Cantonese speakers writes in traditional Chinese characters, while Mandarin is written using simplified Chinese characters. The language issue has been a hot controversial debate in Hong Kong and Macau, which involved complicated political issues and cultural conflicts between Hong Kong, Macau and Mainland China. People criticised the advertisement showing it knew little about Macau and had no respect for the local culture. Despite the criticism, Beckham is adored by millions of people, boasting a healthy 49 million followers on Instagram, and got 1.7 million likes on his most recent picture of himself. Instagram scheduling tool Hopper recently revealed that Beckham earns US$300,000 per sponsored post. As the financials roll out for beleaguered Malaysia Airlines, will the loss of MH370 prove irreparable for the brand? ..
By 2018, mobile advertising expenditure will total US$134billion, which is more than will be spent on newspaper, magazine, cinema ..
Marketing Excellence Awards 2014: What are the judges really looking for? "Creative, cutting-edge and unique campaigns which impact positively on the brand, contribute to the bottom line, and create a new..